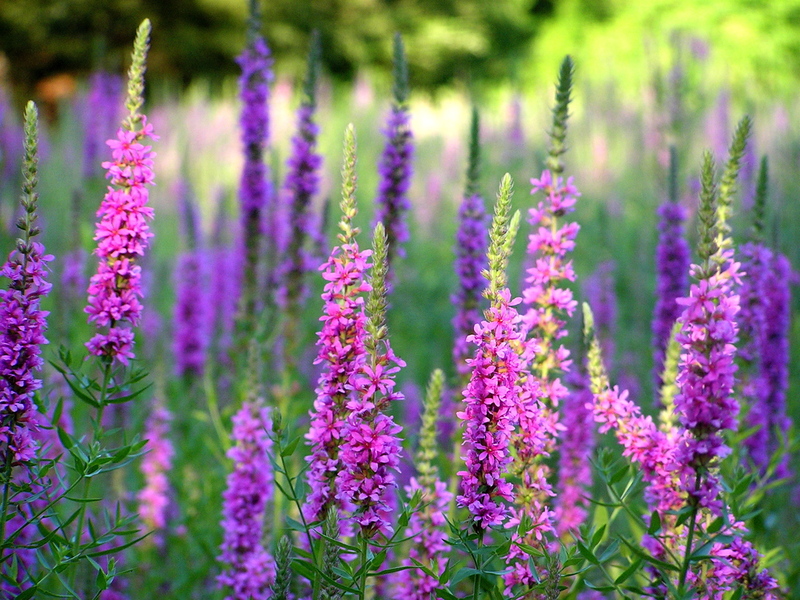 General Description: Purple loosestrife is an emergent aquatic plant. It can reach up to 10 feet tall and 5 feet wide and has a persistent, perennial tap root and spreading rootstock. Flower Description: Flowers are densely clustered on a 4-16 inch terminal flowering spike. Flowers are showy and magenta with 5 to 7 petals. Leaf Description: Leaves are alternate, opposite or in whorls of 3. They are 1.5 to 4 inches long, lance-shaped to narrowly oblong and sometimes are covered with fine hairs. Stem Description: Stems are herbaceous and upright, branched or unbranched and somewhat square with 4 to 6 sides. Each plant may have 30 to 50 stems with flowers that form at the ends. Fruit/Seed Description: Seeds are in capsules. Purple loosestrife is a vigorous competitor and can crowd out other vegetation including native species. It can quickly dominate a site and adapt to environmental changes. Loosestrife stands provide poor cover for waterfowl.